The following page will present an analysis of the causes and consequences of the eurozone crisis. It will do so with regard to several potential causes and structural characteristics of the eurozone and some of its members most struck by the crisis. In particular the analysis will revolve around the cases of the so-called peripheral eurozone countries; Greece, Portugal, Ireland, Spain and Italy. I will cover the potential reasons why the peripheral eurozone economies suffered a particularly hard hit. The political responses and potential remedies to the eurozone crisis have been published in two previous posts. I expect the topic itself to continue for some time as the situation around eurozone currently carries the highest risk for another recession, and so will the page on the crisis be updated. Essentially the page is the summary of the analysis previously posted on the main page of the blog; the first one covering domestic instabilities, the second covering foreign instabilties, the third observing bank contagion and the collapse and the last one pondering the possible outcomes. In light of the expansionary austerity debate in peripheral Eurozone, the conventional solution surrounding Eurozone’s recovery has been a call for fiscal adjustment. The idea supporting austerity arises from the viewpoint of recklessness of peripheral Eurozone governments and their extensive debt accumulation and crippling welfare states. Even though a certain level of fiscal profligacy and strong accumulation of debt were apparent in peripheral Eurozone (and it is certainly the main issue holding back its recovery), this was hardly the most important reason behind a strong and severe recession that struck these countries. The focus of the article will be on the spread of financial contagion onto the peripheral Eurozone economies, namely Greece, Portugal, Ireland, Italy and Spain. The problems that occurred for the peripheral Eurozone economies can be described through three features they all shared: domestic preconditions and instabilities, current account deficits and the euro, and outside contagion from the US. The first are local instabilities and the way these countries ran their economies in the wake of the crisis. This doesn’t in all cases imply budget deficits and debt accumulation, rather each country was characterized by specific conditions which endangered the sustainability of their economies. Ireland and Spain experienced a housing and construction boom and suffered an immediate impact of deteriorating housing prices and loss of construction jobs. 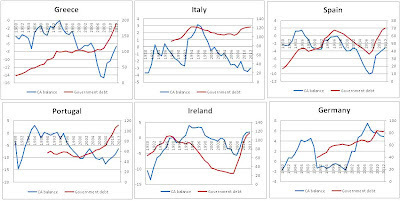 Before the crisis, their fiscal position was fine, with decreasing debt and a balanced budget, but after bank bailouts (Ireland) and bankruptcies of the largest construction companies (Spain), decreasing revenues and increasing expenditures increased their budget deficit and public debt beyond sustainable. Portugal had over-expenditures into large public projects (including building stadiums for the Euro 2004), mismanagement in public services and investment bubbles which all led to a rising public debt and an unsustainable fiscal position. Greece and Italy, both on very sensitive high public debt levels before the crisis (see Figure 2) had an additional constraint – corrupt politicians who cared more of self-preservation than the well-being of their country. Their politicians used expensive populist policies to remain in power. They used cheep borrowing on the international market to fund their electoral victories by broadening its welfare states and offering concessions to particular electoral groups. They ‘bought’ votes by increasing pensions, hiring more public sector workers and increasing their wages in order to create a perception of high employment. Their governments were perfect examples of how the inflow of foreign capital was used inefficiently to finance consumption and maintain political power. The second characteristic was the introduction of the euro. Due to a common currency it became cheaper for the peripheral economies to borrow on the international market which induced large current account deficits. This was the point of a single currency – to ease the movement of capital across borders. But what it created was a dependency on credit from abroad. Once this credit flow stopped the stage was set for the spread of the crisis. They found themselves in a typical sudden credit stop (as explained in Reinhart and Rogoff, 2009), usually a characteristic of emerging economies that pegged their currencies. And third, what brought to the sudden stop of credit, worsening their fiscal balances, was the spread of outside contagion, particularly from the US. The financial crisis that started in the US quickly spread worldwide through decreasing trade and a loss of investor and consumer confidence causing a credit squeeze. All this made it harder for the peripheral economies to borrow on international markets, and since their economies became dependent on cheap capital from abroad to finance their consumption and government expenditures, the credit squeeze proved to be particularly painful. Outside contagion brought the domestic instabilities of the Eurozone economies onto the surface, and created the final trigger for the sovereign debt crisis. Peripheral eurozone economies experienced particularly favourable economic conditions before the start of the crisis. After rough time in the 90-ies, the beginning of the 2000s was characterized as an excellent economic opportunity to all of them. Figure 1. 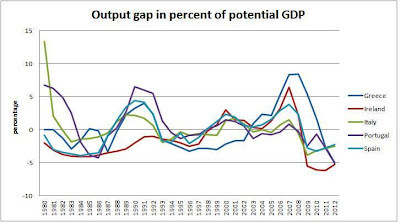 Peripheral eurozone output gap. Some of them grew well beyond their potential levels of GDP, implying a clear sign of an overheating economy. For example, Greece managed to grow 8% above its potential GDP, a growth mostly fuelled by its rising debt and large capital inflows. Ireland and Spain experienced a similar output gap well beyond their potential level, but unlike Greece, the driving forces of their high growth were the asset price booms in housing and construction. Portugal and Italy grew within their potential levels, and weren't overheating as much, but have nevertheless found themselves in similar structural problems. So if high, above potential GDP growth wasn’t a common characteristic, something else was. The usual implication is domestic imbalances and fiscal profligacy. They were borrowing cheep and used this money to live above their means. The inflow of foreign capital fuelled the economies beyond what they were capable of. Only part of that story is true. Outlook, September 2011. Note: All data for 2012 are estimates. Observing Figure 2, a common feature is obvious: right before the start of the crisis, and mostly since the introduction of the euro, all peripheral economies experienced rising current account deficits, while the same period saw a large CA surplus in Germany. Even though Greece didn't have a CA surplus for over 30 years, Portugal, Spain, Ireland and Italy all experienced CA surpluses at some point prior to the introduction of the euro, only to see them decrease rapidly from the beginning of the decade. Government debt increase, on the other hand, fails to give such strong implications. 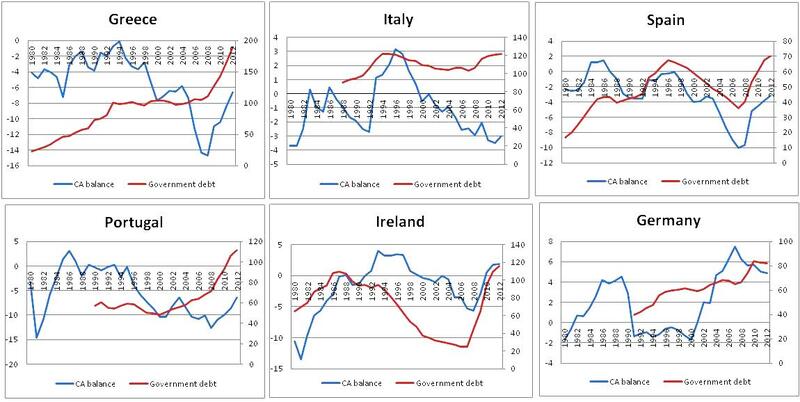 Spain, Italy and Ireland were actually decreasing their government debts and improving their fiscal positions, while Greece kept it steady. It wasn’t until the actual start of the crisis that the debt levels started rising in every country. Therefore, fiscal profligacy isn’t as crucial as often made to believe. Some instabilities certainly did exist, but they couldn't have caused a crisis so severe and so widespread. It is more likely that outside contagion combined with dependence on foreign capital inflows exacerbated the systemic risk of each country. Domestic imbalances became more visible once the foreign inflow of credit stopped. They are now the cause of problems of structural adjustments, but they weren’t the cause of the contagion itself. When one country runs a current account deficit, this implies it runs a surplus in its capital account. A capital account surplus means an inflow of foreign capital into a country (foreigners buying more domestic assets) which is essentially a good thing since money will always flow to where it expects the highest and safest returns. However, the question is where is the money from abroad being transferred to domestically? If it is used to finance investment (into manufacturing, productivity increase or any other wealth creating activity) instead of consumption, then the deficit can carry on rising as the country is using the inflow of capital to boost its production facilities and increase growth. If it is used to finance consumption and government expenditures focused on politically popular policies, then the outcome might be an asset price boom or an unsustainable fiscal position of the government who is becoming dependent on foreign capital to finance its exaggerated expenditures. Ireland, Spain and to some extent the US suffered from the first, while Greece, Portugal and Italy suffered from the former. Before the euro Greece had a history of debt defaults, financial contagion, inflation crises and banking crises (see Reinhart and Roggof, 2009). This was usually reflected in its higher bond yields – a risk premium for investing in its debt. The spread between Greek and German bonds was historically always high. However, once the euro was introduced, its yields and the spread started decreasing making the Greek debt as safe an investment (financially) as the German debt. The reasoning behind it was that the ECB would make sure inflation and currency instability will never again be the problem of Greece or any other peripheral country. 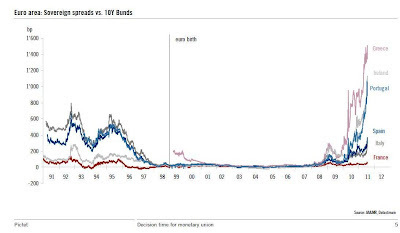 Soon enough, every peripheral Eurozone bond on the market traded as the German Bund – the spreads were smaller (see graph below) and the risks were perceived as non-existent (Basel II recognized their debt as zero risk-weighted assets). This meant one thing; all these countries could borrow at cheap rates, while its politicians had no need to be fiscally responsible and could resort to populist policies that would keep them in power. Borrowing cheaply meant that credit from abroad was used to fuel domestic consumption which led to a rapid increase in GDP above its potential levels, either through high government spending (Greece, Portugal) or housing market booms (Ireland, Spain). Figure 4 observes how the inflow of capital was used in peripheral Eurozone. It compares levels of consumption, government expenditures and gross fixed capital formation (fixed investments) for each nation observed to evaluate the sustainability of the CA deficit. and consumption (right axis, green) are all taken as log variables. Source of data: St. Louis Federal Reserve Economic Data (FRED), February 2012. 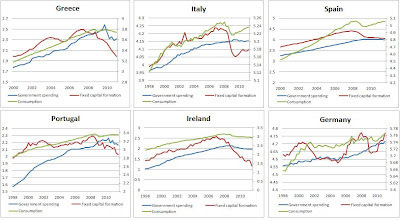 From the graphs it can be inferred that in all these countries, except Italy, consumption was growing much faster and more stable than fixed capital formation. In Italy and Ireland they grew simultaneously right about two years before the crisis until the housing prices started to fall - the same effect can be noticed in Spain. Greece and Portugal saw steadily increasing consumption, with investments being more cyclical and volatile. In Germany, fixed investments have deteriorated immediately since the introduction of the euro, when a lot of German capital flew across borders. Government expenditures also show a rising trend for each country (represented by the blue line). 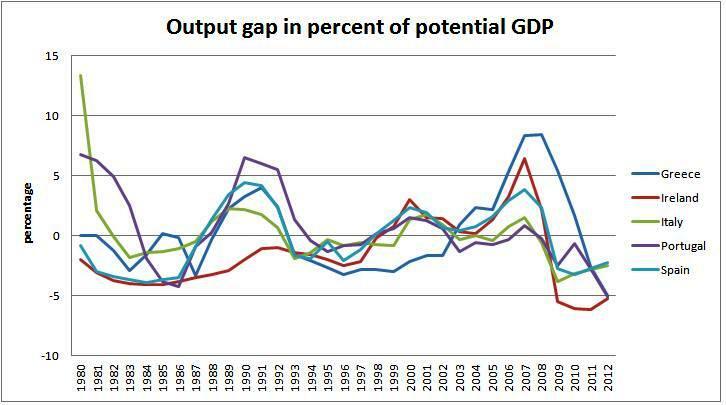 For all the countries government expenditures were closing the gap between investments. 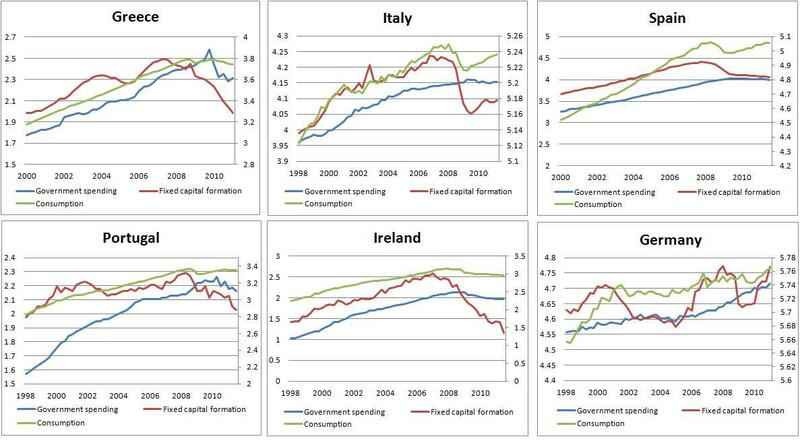 In Spain they grew simultaneously with investments, while in Ireland they grew simultaneously with consumption. In Greece, they grew rapidly, doubling in absolute terms over the past decade, while Portugal experienced a significant decrease of the gap between investments and government expenditures after the introduction of the euro. Interest rates were low across the Eurozone, and investors in core countries seized this opportunity to invest in periphery economies. In Germany lack of domestic demand was substituted by investing abroad. It became more attractive to invest in the periphery as the risk of default was diminished by the fact that the euro was backed up by all Eurozone nations. Capital outflows came mainly from the core as it became available for German and French investors to broaden their portfolio onto new, yet stable markets. The system of borrowing to fuel domestic asset bubbles worked as long as the asset prices kept rising. Borrowers could pay off their loans simply by borrowing more even cheaper. The problem arose when the inflow of capital suddenly stopped due a spread of the US financial contagion across the globe. Investor confidence rapidly declined worldwide and the peripheral Eurozone countries faced the same fate of the Latin American countries in the 90ies, since they were no longer able to issue debt in their own currency. Investors didn’t react well to this. The sudden stop in 2009 made it difficult for these countries to roll over their debts which increased the European crisis of confidence and led the peripheral economies into a sovereign debt crisis. 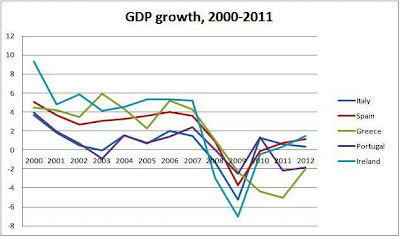 Essentially the idea of the euro was to increase and smoothen convergence in the Eurozone. Adoption of the euro made it easier for capital to flow into the peripheral countries. Their CA deficits prove this. However, this was an anticipated reaction and a welcomed move from the Eurozone policymakers. It indeed helped fuel and sustain economic growth way above its potential level for some of these countries. It was supposed to be used to make their economies more competitive. But consumption and government expenditures (and an asset price bubble in Ireland and Spain), rather than investments, were fuelling growth creating dependency on foreign capital to service current liabilities. An increase of systemic risk and asymmetric outside shocks that led to a stop of credit exacerbated the existing instabilities in peripheral Eurozone. Figure 5 serves as a good reminder on importance of debt levels and the sustainability of these debt levels on investor confidence and country bond yields. Greece, Italy, Portugal and Ireland (4 out of 5 countries analyzed) are countries with the highest debt burdens in the eurozone and are the countries most exposed to the threat of default. "Banking crises in advanced economies decrease growth of these economies. This slowing of growth and economic activity will hit exports thus eliminating availability of hard currency to emerging market countries, making it more difficult for them to service their debts. Banking crises will decrease investor confidence and make them withdraw from risk taking and move their money into safe assets (such as low-yield government securities). Again, emerging markets will find it much harder to borrow on the international market as the yields on their bonds will rise and they will become less attractive to investors." There are striking similarities with the case of the eurozone economies. The only difference is that they didn't depend on commodity prices to drive their exports, but the credit squeeze and the dependence on credit from net lenders forced them into a situation where they were unable to service their debts anymore, and their economies contracted. Now, due to a severe decrease in confidence they find it hard to borrow on international markets and are entering into an even higher dependency on foreign aid from either Germany, the ECB or eventually the IMF (in the emerging markets case, it's usually only the IMF who comes to the rescue). I.4. How the banks got caught up buying peripheral debt? As was already noted in this blog, eurozone banks were buying the peripheral debt as part of their zero risk-weighted assets. While the regulatory requirement on holding a corporate loan was 8%, the capital requirement for holding sovereign debt was just 1,6% (sovereign debt, considered to be a zero risk asset was given a 20% risk-weight, resulting in the total 1,6% of capital requirement for sovereign bond holdings). This meant that if a bank was to lend to sovereigns instead of businesses it could make much more money (leverage on sovereign bonds was 62.5 to one compared to leverage on business loans of only 12.5 to one). This created a huge incentive for the banks to increase profitability. It opened a whole new area of investment, similar to what the recourse rule did for the mortgage market in the US. Accusing the bankers of being greedy based on their huge holdings of MBSs and/or peripheral sovereign debt can only be done by someone who doesn’t understand the elementary principle of business economics (or microeconomics) – businesses use scarce resources to maximize their wealth, i.e. their profitability. Companies are motivated by profits, it is what drives them forward, it is what drives economic growth and it is what drives capitalism to succeed as a system. Banks, just like any other private business, will always look for ways to increase its revenues and minimize its costs and risks. By investing into sovereign debt they were doing just that, reducing their exposure to risks, minimizing costs of lending and maximizing their profits. They were following the Basel accords whose initial idea was to make banks safer and more prudent, but through guiding their investments and creating new demand for assets they yielded the exact opposite result of what they were aiming at. The regulatory paradox is once again evident. By recognizing Greek debt (for example) as a safe asset, they artificially increased demand for this asset. An artificial increase of demand resulted in too high exposure of EU banks to Greek debt, which is the reason behind a particularly delicate situation regarding the Greek default, as most private Greek debt holders are EU banks. It is their bancrupcy and/or nationalization, not the default itself that may prove to be the trigger for another depression. What was the end outcome of an artificially created demand for peripheral debt? It made it easy for the governments of these countries to borrow to fund their populist, electoral winning policies. It worsened domestic fiscal balances of these countries and worked towards increasing their debt levels. Higher debts in Italy and Greece were evident even before the crisis. The Basel accords only further endangered the fiscal positions of these countries and haven’t worked at all towards decreasing the systemic risks for their banks. Figure 6. 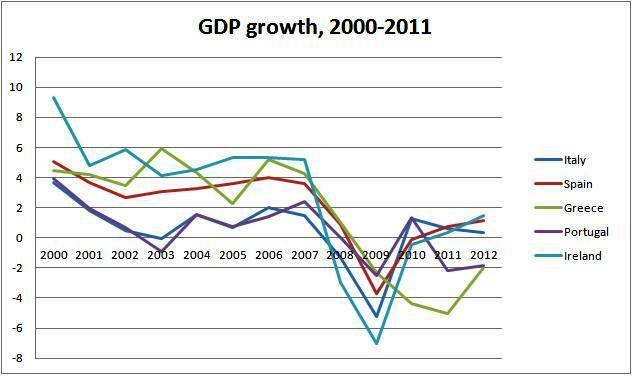 GDP growth in peripheral Eurozone economies, 2001-2011. Figure 7. 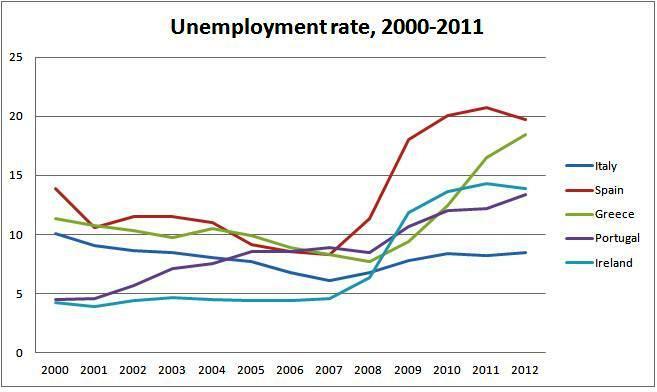 Unemployment rate in peripheral Eurozone economies, 2001-2011. Source: IMF, World Economic Outlook, September 2011. The data for 2012 are estimates. The sudden credit stop was a result of a recession spreading from the US. As was described previously, a banking crisis in the centres of world finance (New York, London) yields a credit squeeze on the international market, and a severe decrease of investor confidence. As a result emerging market economies and economies dependent on foreign lending to finance its consumption find it much harder to borrow on the international market and see their bond yields rise and their debt harder and harder to service. This was an inevitable scenario for the eurozone peripheral countries. A stop of borrowing from the core eurozone countries such as Germany, triggered by the US financial crisis, exposed the depended peripheral countries to the threat of default. Fiscal deficits and rising public debts acted as a signal to investors to exit from eurozone peripheral debt and the yields started rising. Even though the current account deficit proved to be the leading reason behind the countries respective bubbles, investors usually make the decision to buy government bonds based on whether the government will be capable to service its debt obligations and pay out interest, i.e. to stay solvent in the future. As soon as they see a rising fiscal deficit and more and more debt pilling up the probability of staying solvent decreases and the country's debt becomes a more risky investment. However, the cases of Ireland and Spain were somewhat different. As stated previously they were running a real estate boom, much like the one in the US, and suffered an immediate impact of deteriorating housing prices and loss of construction jobs. The construction and housing industries carried a lot of employment so when the building boom stopped and turned into a bust, employment soared down in both countries (see the second figure and observe the rapid increase of unemployment for both these countries in particular). In his text in the New York Times in January 2010, Paul Krugman recognizes the start of troubles for Spain and Ireland through a large fiscal deficit that arose due to a severe decrease of revenues since tax receipts were mostly depended on real estate transactions. As was shown previously, the government debt levels of Spain and Ireland rose particularly high after the bubble burst on their housing markets. 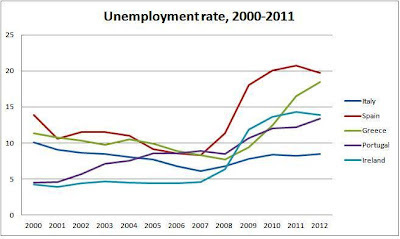 Furthermore, as unemployment rose, so did the costs of unemployment benefits, which led both Ireland and Spain from a budget surplus into a huge budget deficit. In addition, Krugman adds, guarantee on bank debts by the Irish government increased the Irish debt substantially and brought its own solvency into question. All this worked further in decreasing investor confidence regarding the eurozone situation and the result was even more short-selling of peripheral government debt and higher yields and spreads over the German Bund. Loss of confidence further crippled any Keynesian solution of spurring big money into the economy. No matter how much liquidity was being pumped in the system, no one would use it to increase lending and businesses lost support. As opposed to American companies eurozone companies are much more dependent on bank loans to fund their business (80% of EU companies compared to only 30% of US, according to the FT). It is obvious how a lending freeze and reluctance of banks to lend further due to their increased contagion from enforced exposure to peripheral debt resulted in severe consequences for the real eurozone economy. III. What were the outcomes? 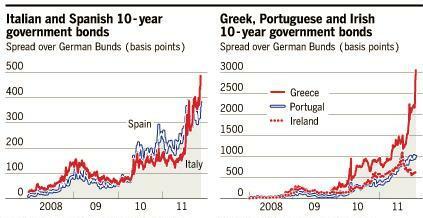 In the last year every peripheral eurozone government was kicked out of office. 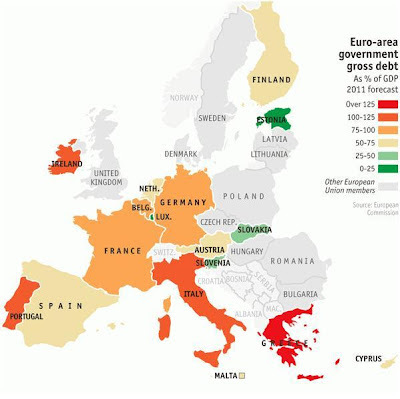 Portugal and Ireland changed governments earlier in the year, Italy and Greece most recently got technocratic governments, while Spain held elections this Sunday and saw the victory of the conservatives announcing cuts and fiscal responsibility. The political implication of the crisis was huge, and naturally the politicians needed to pay the price. Governments such as Italy’s Silvio Berlusconi who managed to avoid being removed from office for a decade (apart from a brief 2 year period) has finally seen his political career finished. It wasn’t the corruption or reckless behaviour, it was the European bond markets that brought down the peripheral governments. And the very same bond markets are threatening future recovery and the existence of the eurozone and its currency. The bond yield spreads in the eurozone have been relentless in punishing incompetent governments and they were right to do so. The governments failed to adopt necessary reforms and were thus removed from office. They were supposed to restore investor confidence and set a stage for economic growth. Instead they lacked a proper soulution and were avoiding the necessary reforms afraid of losing popular support. On the other hand, The ECB refused to act as lender of last resort as it insists it cannot replace the governments in restoring investor confidence. The markets reacted as they should have - via rising bond yields. Higher bond yields (or spreads over the German bonds) simply reflect unsustainable public finances of its issuers. Investors don’t believe that the issuer will be able to service its liabilities in the short run and the costs of borrowing rises. The real danger is when the bond yield spread rises above 500 basis points. This implies higher costs for debt holders in the form of margin requirements (collateral payments made when bond prices fall) and could lead to a further cycle of higher and higher yields. This is what happened to Ireland before its bonds were given a “junk” investment grade. Italy has already jumped through that spread and Spain is close enough. The danger is higher and higher costs of borrowing and more illiquidity for these countries that will inevitably lead to their insolvency. Figure 8. Source: Financial Times, Martin Wolf: "Thinking through the unthinkable"
According to the latest data on economic growth and forecasts of future growth the double dip recession has arrived. Even though the data for October and November haven’t been taken into account (months that showed largest instabilities), there were signs of decreasing growth, probably due to expectations of future instabilities. One can rightfully conclude that another recession is here, and this time the cause is political. The inability of the politicians to reach a plausible conclusion on how to resolve the crisis of confidence in Europe is appalling. The rise of bond yields in Italy, Spain and France, and the lack of liquidity for German bonds is a natural reaction of the markets to political incompetence. Rather than focusing on policies to restore growth and stick to a credible debt and deficit reduction strategy, the politicians continuously choose temporary short-term fixes. The markets can only bear these to a certain extent. The best proof is the signals after the Berlusconi exit in Italy – even though most of the politicians expected a stabilization on the debt market, it surprised everyone by having Italian bond yields jump above the “unsustainable” 7% boundary. It shouldn’t have come as a surprise, though. There is nothing the investors can think of that will make them feel safe. Higher bond yields for Italian debt is an effect of no recovery. Things are still too uncertain, despite the technocratic government. When they devise a credible plan on how to reduce Italy’s huge debt burden and how to restore economic growth, which might take years, then Italy can finally see a decrease of its yields and easier financing. Italy is on a brink of another recession the former government drove them into, and investors are hence losing confidence. The more time it takes PM Monti to design a credible growth strategy and to resolve Italy’s high corruption and public sector problems, the harder will it be for them to borrow on the international markets. The eurozone debt crisis was triggered by misusing the welfare state to fund electoral victories by advocating populist policies under the idea of social justice. Populism, described by white elephant projects and pork-barrel spending, can never create sustainable wealth. It can only lead to an inevitable disaster and higher social injustice which can trigger social turmoil. The political economy implication in the eurozone debt crisis is huge. The causes lie within several factors; large CA deficits due to the introduction of the euro and a misguided idea on how it was supposed to work, internal instabilities that used cheap borrowing to fund populist policies, a US crisis that lead to a sudden credit stop which emphasised the domestic instabilities, and finally a regulatory system that steered banks' investments into sovereign debt which caused the threat of default to be far greater than it usually is. Two solutions are available; either the ECB enters the market a lender of last resort and monetizes debt, which might lead to hyperinflation – a strategy Germany strongly opposes, and rightly so, or we might see serial defaults of certain eurozone countries. This was obvious three months ago and it is obvious now. However, during all this time no credible solution was proposed and the position of all these countries and the eurozone itself became unbearable. Unlike the recession in 2008 triggered by Lehman, this one will be triggered by the severe loss of confidence in the bond markets caused by political incompetence. Copyright: Vuk Vukovic. Please see disclaimer. excellent stuff! thank you very much for such an in-depth analysis! nice sum-up, but what do you think will happen to the eurozone next? Is there a way out? I'm thinking that suborn politicians and the ECB will ultimately fail to provide any solution, and I think this is what Germany really wants- to bring back its deutsche mark, and get out of the whole "nation bailout" situation.. I'm not in a position to make credible predictions, but I was, I would say the next step is a fiscal union. Merkel is calling for it for quite some time and she is reluctant to accept any solution (eurobonds, printing money) other than a fiscal union where she might impose strict controls on reckless countries. On one hand I'm glad she's not caving into the pressure for calls on money printing (the idea for ECB as the lender of last resort to governments) and I'm glad she's eliminating the threat of hyperinflation, but on the other hand I'm not sure how this new fiscal union is supposed to look like. If it at all resembles the European Commission, I would be against it, which I'm sure it will. It will call on European collectivism and similar nonsense. But at this point, I think we are ready to accept just about anything to keep the world out of another painful depression. Your analysis is spot on! the CA deficit financing is the whole point - if it went to investment that led to a sustainable growth for the economy, one shouldn't worry about it, but if it went to overconsumption and overspending from the governments to finance political goals, than we should worry about the sustainability of their balance of payments position. And I agree, the credit crunch from the US only exposed this weak BoP position in peripheral Europe. Not sure where the term peripheral economy is being used to describe Italy and Greece. Remember Europe and much of Western Civilisation is based on the legacy left by these nations ie Ancient Greece, Rome and through the Enlightenment. Remember Germany still called itself the 'Holy Roman Empire' until only a couple of hundred years ago. This is all true, but I'm not sure historical antecedents played any role in determining the title "peripheral" in this case. This was primarily due to large existing differences in relative wealth, productivity, and most importantly the exposure to risk of country default (which drove the bond yields high). It was convenient that all these countries are on the borders (periphery) of the EU. I'm very glad you found the blog helpful. My initial aim was to educate, so I'm happy it's helping people. I hope you stay a regular reader. Really good summary Vuk, one of the better I've seen out there. I just have this terrible fear that this entire mess will continue to drag on and on, with constant meetings, kicking the can down the road, until it explodes and takes the world economy down with it. Thanks! Well, these were my initial fears as well, but somehow I hope that the politicians will find a solution. After all their re-election depends on that. And there's no better incentive for a politician to do something if the punishment is being thrown out of office. "Accusing the bankers of being greedy based on their huge holdings of MBSs and/or peripheral sovereign debt can only be done by someone who doesn’t understand the elementary principle of business economics (or microeconomics) – businesses use scarce resources to maximize their wealth, i.e. their profitability. Companies are motivated by profits, it is what drives them forward, it is what drives economic growth and it is what drives capitalism to succeed as a system. Banks, just like any other private business, will always look for ways to increase its revenues and minimize its costs and risks."... In modern economy there is no such thing as completely safe investement, and although regulators "encouraged" banks to hold souverign debt, banks should doubt in PIIGS ability to repay debts when their pre-crisis economic indictors were taken in consideration... After all, long before introduction of EURO, significant number of economists anticipated currency union disadvantages due to the fact that Eurozone is not optimal currency area... In my opinion banks hold sizeable responsibility (in smaller extent than politicians) for their lending and their "marriage" with regulators and rating agencies should be dismantled. In the end, it's taxpayers who "nationalize" their losses and take only 20-30 % of their profits (CIT) when it's going good. Thanks for a great comment, Ivan. I agree with you, there is no such thing as a completely safe investment. This was, in my opinion, a crucial error made by most of the financial system, including both banks and regulators - they were trying to eliminate risk. 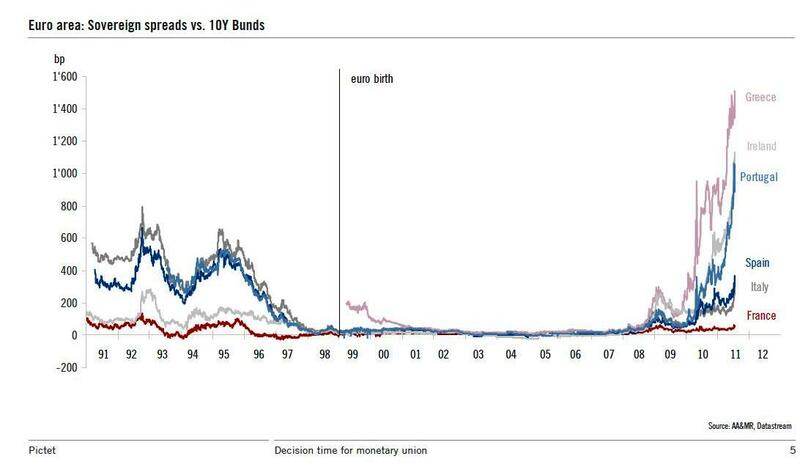 The result (at least in Europe) was the graph showing bond yield convergence for eurozone countries. This literally meant that Greece, with all its structural issues, could borrow at the same rate Germany did. Naturally this created a huge incentive for Greece's rising debt and fiscal profligacy. This I think was an important issue - the distorted incentives caused by an attempt to eliminate risk. Again, you correctly note that the instabilities of the euro were known to economists precisely because the eurozone was never an optimal currency area. And none of these were obviously taken into account among investors. In retrospect, I was perhaps a bit harsh in my initial claims on the "innocence" of banks(the thing you quote). I think that particular quote was aimed at those who blame solely greed for the unfolding of the crisis. Greed is always present, it's the problem of incentives into where the greed is channelled. Is it even legally possible for EURO to breakup, or the worst thing which could happen is slowly dying of economies inside and outside (Croatia again). I agree on the culprits. One good example of how the banks cooperated with the governments and regulators was the LIBOR scandal in London (I wrote about it back in July, take a look). This was blamed on 'rouge' traders, but I feel the problem was more systemic. I didn't picture it from a Croatian perspective, but more form a global perspective looking at immediate effects on Eurozone's main trading partners (US, UK, China). From what I wrote back then, I think the consequences for a small open economy sensitive to foreign shocks (like Croatia or any other country in the region), would be devastating. "The first effect is a decrease of exports to any country outside the eurozone which is its significant trading partner. Examples include the UK, US and China in particular. Also, a fall in the value of the euro will result in appreciation of the trade partner currencies, the sterling, the dollar and the renminbi respectively which will come as an additional constraint to exporters. An even more significant effect will be the financial linkages since all the banks invested in the eurozone will experience significant losses by sovereign defaults and euro banks defaults. A contraction of credit on the domestic market is a natural consequence not only due to huge losses of banks, but also due to a significant decrease of investor and consumer confidence. Loss of confidence will spill over to the real sector and growth will start deteriorating while unemployment may rise even further. The already fragile recovery will be shattered as the final effect may be a deep depression due to a lack of solutions to bring up consumer confidence again." great article but may I just ask the nature and implications of the Eurozone debt crisis? what measures can be taken to solve the sovereign debt problems? A great question we're all trying to find an answer to. There has been a whole variety of proposals and ideas generated in the past three years. I've covered some of these, endorsing certain solution, and criticizing others. Here you can find all of my text under the Eurozone tag. It is a topic I return to constantly, evaluating all sorts of solutions. If I had to sum up the general idea, it would be structural reform. Let's aim for this facts to have changed by now. They certainly did, even though the underlying problems still do exist. This Trumpian neomercantilism is ridiculous! Is technological progress at the heart of stagnation? Having more money helps the poor? Go figure! Richard Koo's "balance sheet recession"
Copyright: Vuk Vukovic. Simple theme. Powered by Blogger.